Imagine this scenario. You're sitting down for dinner and your phone rings. You hear a voice on the other end of the line inquire, "Is this (your name here)? Do you have a moment to talk about insurance?" You're immediately resistant, eager to get off the phone. That's because the seller is using a cold-calling script. We get it. Cold-calling is scary and difficult. 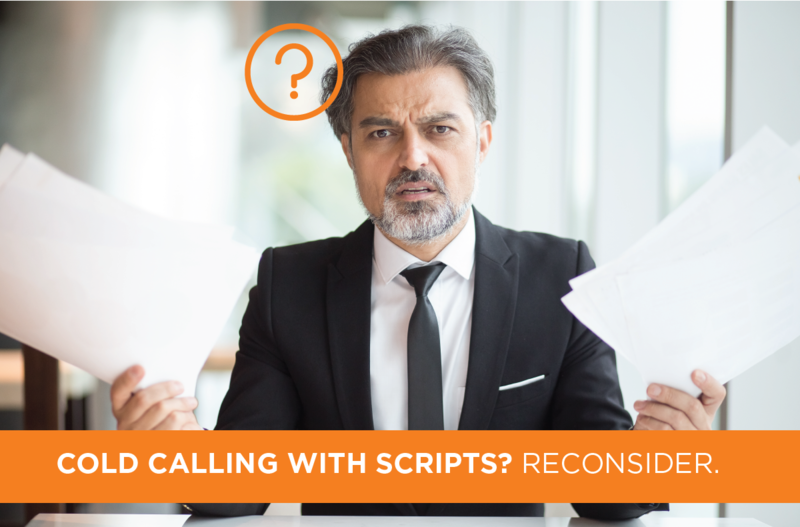 It's tempting to use a script to help navigate the pitfalls of making unsolicited sales calls, to follow a roadmap instead of heading into uncharted terrain. It's best to resist this temptation, as reading from a script can actually damage your real estate business. Here are some things you need to know about cold calling scripts and why they could be limiting your prospecting. Authenticity is essential to truly succeed in today's economy. While it's understood that everybody is in business to make money, our customers and clients need to trust that we care about them more than the bottom line. Keller Williams' agent Steve Clark has talked about the duality, "That if you are in this business to make money, you will not make money. But, if you are in the business to simply help people, you will make more money than you ever thought you could." Being a real estate agent is about more than just business. Real estate is a service industry. It's about putting people in their ideal home or office, at the end of the day. That's why 'a desire to help people' is one of the most important qualities in a real estate agent, right ahead of a passion for real estate. Cold calling scripts feel phony and forced. The customer doesn't believe that you care about them. Likewise, your passion for real estate doesn't come across when you're reading off the page. They're stiff and formal. It's hard not to sound like you're reading off a script unless you're a trained thespian. Scripts don't lend themselves to rapport or engagement, which is where conversions come from. Potential customers need to feel like we're interested in them. It's hard to pull that off when we're basically just checking off boxes. Tone of voice and emphasis are two of the most important traits for sales calls. It's hard to master these while reading off of cold calling scripts. Scripts fall apart when customers ask unexpected questions. The best cold-callers are able to adapt and be flexible in the moment. Cold-calling requires an excellent hook. Many scripts have bland, generic intros. We understand that cold calling scripts were created to help navigate the most common real estate sales scenarios. Seeing as how cold-calling is still a valuable prospecting tool (although certainly not the only way to find useful leads), it's still a useful tool to have in your kit. Here are 7 useful cold-calling tips that will serve you better than cold calling scripts. Focus on your client, not yourself. Remember, you are offering a service. It's about the customer and their needs. You're there to help. Plan all of your questions in advance. This will help you feel prepared and relaxed. Don't read off the page. Don't bombard your client with information in the first conversation. Remember the Sales Cycle. Help keep your client relaxed. Don't try to make a sale in the first meeting. Find out what your customer is looking for, and what might entice them to purchase from you over another real estate agent. Authenticity, a passion for real estate, and a desire to help people are the most important traits for a successful real estate agent. But how do you get those traits across when talking to somebody for the first time? Unless you're a Shakespearian actor, you likely can feel the difference when you start reading from a script. So can your customer. It's tempting to think you can force yourself to sound natural while reading, but that's very hard to pull off. Have you ever had someone corner you at a party and proceed to talk about themselves for an hour? That's what a one-way pitch sounds like at the beginning of a cold-call. It's dreary to begin with, but when we're trying to get someone to part with a potentially very large sum of money, it's the kiss of death. A customer isn't that likely to make a decision on a big purchase like real estate in one phone call. Sales is a journey, remember, and cold-calling is the first step. Instead of trying to close immediately, focus on getting your prospect talking, asking questions, or expressing concerns. This will help you to know what they're looking for, so you can give it to them. Try running through your sales pitch with a friend and record the conversation. Listen to the inflections in your voice, and try and pay attention to any cues or responses from your friend. This will not only give you an idea of what you sound like but also how you're being perceived. Setting realistic goals for your cold-calling is one way to stay motivated. It's also a way to set landmarks to guide our process and to keep stock of how we are progressing. Cold-calling is still a valuable source of prospects and potential leads when it's done properly. By focusing on the customer and creating a conversation, we avoid the stiffness of scripted cold-calling. It could mean the difference between closing and losing a lead. Looking For More Ways To Grow Your Real Estate Business? From FSBOs to Expired Listings, our suite of real estate resources can help your agency or real estate investments skyrocket. Contact us today to get started on your journey!